Hello! 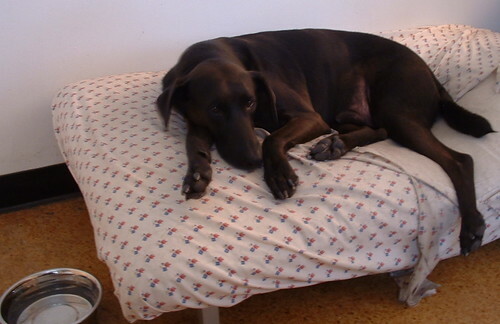 I'm Dale, lounging on my bed after a hard day's play at the dog run. See what a big bad boy I am, ripping up the sheets by scratching my long beautiful nails on them! And do visit Sweetnicks to admire all my other friends. He is a big fella, isn't he? Do you have trouble clipping his nails? We can't get the clippers anywhere near our dogs, especailly Donegal. She absolutely freaks out. Even with three of us holding her, the vet couldn't snip more than a couple. It's gotten where it's more effort than it's worth! And because of this, I can always tell which dog is which, by the clippity-clop of the nails! Dale is such a cutie. Hi Stephanie, yes the problem is with Dale being a drama queen when it comes to clipping nails :) I have to say that he does allow it very grudgingly but with all the drama it takes an hour to clip his nails....consequently it does not get done often enough! I could paint his toes, thats how long his nails are! What a big bed he's got!!! You're lucky to have such a cute buddy in the city. How do you do it? I don't think I could take care of a puppy in the city. When you go to work do you leave him in your apt? Hi Mona, well, my fiance works just 5 minutes away from his apartment, so he comes home at lunchtime and in the early evening to walk Dale and make sure he is OK. so it works out well.